Western blot analysis of extracts from PANC-1, A549, and Hep G2 cells using MRP1/ABCC1 (D5C1X) Rabbit mAb. Immunoprecipitation of MRP1/ABCC1 from Hep G2 cell extracts. Lane 1 is 10% input, lane 2 is Rabbit (DA1E) mAb IgG XP® Isotype Control #3900, and lane 3 is MRP1/ABCC1 (D5C1X) Rabbit mAb. 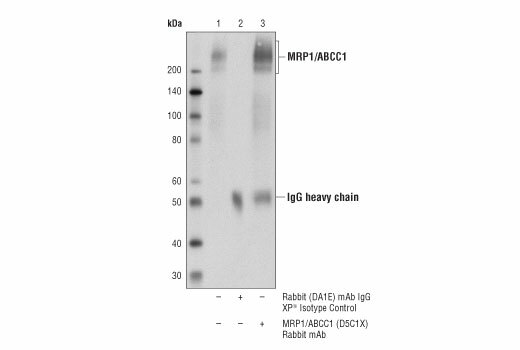 Western blot analysis was performed using MRP1/ABCC1 (D5C1X) Rabbit mAb. 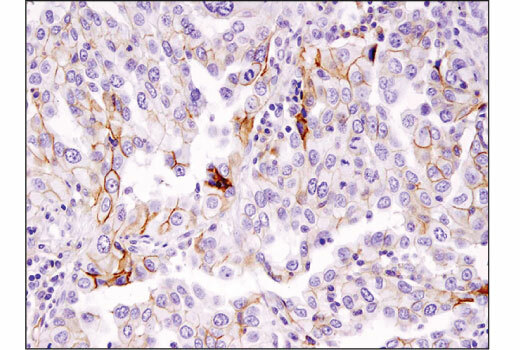 Immunohistochemical analysis of paraffin-embedded human lung carcinoma using MRP1/ABCC1 (D5C1X) Rabbit mAb. 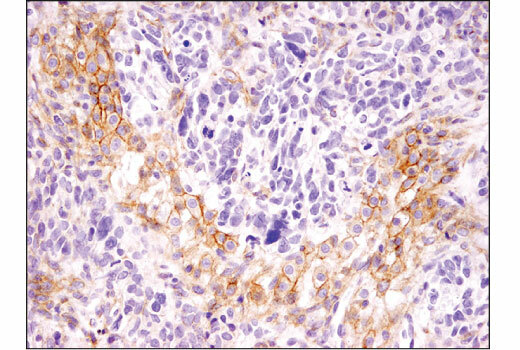 Immunohistochemical analysis of paraffin-embedded human ovarian carcinoma using MRP1/ABCC1 (D5C1X) Rabbit mAb. 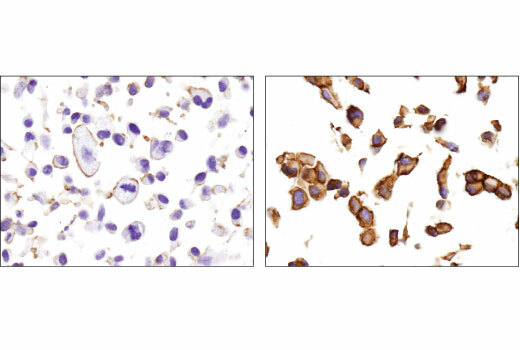 Immunohistochemical analysis of paraffin-embedded SK-MEL-2 (left) and PANC-1 (right) cell pellets using MRP1/ABCC1 (D5C1X) Rabbit mAb. 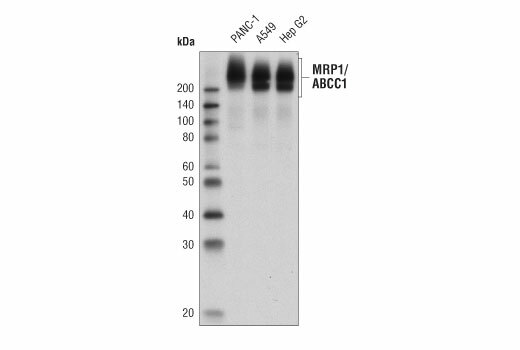 MRP1/ABCC1 (D5C1X) Rabbit mAb recognizes endogenous levels of total MRP1 protein. This antibody does not cross-react with MRP2 and MRP3 proteins. Monoclonal antibody is produced by immunizing animals with a synthetic peptide corresponding to residues surrounding Val273 of human MRP1 protein. Multidrug resistance-associated protein 1 (MRP1/ABCC1) is a member of the MRP subfamily of ATP-binding cassette (ABC) transporters (1). MRP1/ABCC1 protein functions as an organic anion transporter. It has a broad range of substrates, including antineoplastic or therapeutic agents and the glutathione (GSH) conjugates of these compounds. MRP1/ABCC1 also transports physiological substrates such as folates, GSH and GSH disulfide (GSSG) conjugates of steroids, leukotrienes, and prostaglandins (2,3). Although MRP1/ABCC1 is generally expressed in normal tissue, upregulation of MRP1/ABCC1 has been found in a variety of solid tumors, including small cell lung cancer, breast cancer, and prostate cancer (1,4,5). Research studies show that overexpression of MRP1/ABCC1 facilitates the elimination of therapeutic agents from cancer cells and confers drug resistance in those patients. Research studies also show that elevated expression of MRP1/ABCC1 is a negative prognostic marker for breast cancer and small cell lung cancer, as the level of MRP1/ABCC1 is predictive of the response and toxicity of chemotherapeutic agents in those patients (6-10). Cole, S.P. et al. (1992) Science 258, 1650-4. Pajic, M. et al. (2005) Cancer Lett 228, 241-6. Deeley, R.G. and Cole, S.P. (2006) FEBS Lett 580, 1103-11. Atalay, C. et al. (2006) Tumour Biol 27, 309-18. Sánchez, C. et al. (2011) Prostate 71, 1810-7. Nooter, K. et al. (1997) Br J Cancer 76, 486-93. Hsia, T.C. et al. (2002) Lung 180, 173-9. Kuo, T.H. et al. (2003) Nucl Med Biol 30, 627-32. Sánchez, C. et al. (2009) Prostate 69, 1448-59. Vulsteke, C. et al. (2013) Ann Oncol 24, 1513-25.